After Islamic State of Iraq and Levant (ISIL) was driven from Jarabulus, Turkey’s focus turned to fighters with the Kurdish-led and U.S.-supported Syrian Democratic Forces (SDF). “We are closely monitoring reports of clashes south of Jarabulus – where ISIL is no longer located – between the Turkish armed forces, some opposition groups, and units that are affiliated with the SDF (Kurdish-led Syrian Democratic Forces),” Cook said. The United States “was not involved in these activities, they were not coordinated with U.S. forces, and we do not support them,” he said. Ankara said on Aug. 28 its forces had killed 25 Kurdish “terrorists” and insisted the army was doing everything possible to avoid civilian casualties. 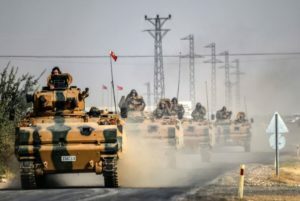 But the Britain-based Syrian Observatory for Human Rights said at least 40 civilians were killed in Turkish shelling and airstrikes on two areas held by pro-Kurdish forces, the first report of significant civilian casualties in Turkey’s operation. Turkey began its operation in Syria against ISIL and Kurdish fighters from the People’s Protection Units (YPG) on Aug. 24. Turkey considers the YPG, which is the main component of the U.S.-backed SDF, a “terrorist” group and said it would continue to target the group if it failed to retreat east of the Euphrates River. “We have made this clear to the YPG elements of the SDF. We have reiterated our view that the YPG must cross back to the eastern side of the Euphrates and understand that has largely occurred,” Cook said.